An uncommon and intense discipline is evident in every encounter with Jorn Utzon’s Bagsvaerd Church. The rigor that inhabits the building is legible in the floor plan, section, and elevation drawings that have been published over the years and in the construction documents that have recently become available. Virtually every line in the drawings corresponds to the real limits or contours of prefabricated components in their correct places and it is reasonable to conclude that this is how the architect saw the building in his mind. But Bagsvaerd Church is a building that only reveals itself fully in the light of day. At first glance, the repeated elements and the planning modules they define suggest that the content of the building is similarly serial, single-minded, and routine. The building is relentless and cool, particularly when seen from the outside and it has been observed that its exterior has an industrial or agricultural flavor.1 It is white and windowless, as horizontal as a train, and its quiet, constant proportions lend it an air of efficiency, inevitability, and composure. However, as quickly as these perceptions are established, they are contested by a satisfyingly awkward vertical departure from its otherwise dominant length. In other words, the building at first appears to be explicit about its intentions. But this unexpected rise, asymmetrically located and launched in stages, hints that this building has another allegiance altogether. In Scandinavia, if you want to find the sun, just look around the horizon. Low-altitude sun is a feature of the sky throughout the year, which means that it usually travels in or near the human cone of vision and, under clear skies, is a persistent source of glare. More generally, Nordic sun and skylight conditions are a rhythm of annual extremes. The sky is bright and the sun visible almost around the clock and around the entire horizon in summer, while in winter, daylight is limited to relatively few hours each day. On December 21, the sun crawls above the horizon just long enough to reach an altitude of 11 degrees at noon and much of November, December and January are overcast. 4 The result is that the top of the sky dome is a fairly consistent source of skylight–comfortable, diffused illumination–throughout the year. Utzon is said to be sensitive to glare, 5 and perhaps this condition led him to appreciate the character of skylight, which is, itself, reflected sunlight. In any event, the distinct low sun path permitted Utzon to configure the church so as to intercept, filter, and reflect direct, low-altitude sun while welcoming diffused skylight, mostly from the top of the sky. Accordingly, Bagsvaerd’s perimeter has virtually no windows. Instead, courtyards, corridors, and the sanctuary reach upward to receive light. And although, like his other projects, the church admits of many formal world influences, Utzon’s lighting strategy is fundamentally Nordic, manifested pragmatically, and probably deeply personal. If Bagsvaerd’s relentless, opaque elevations are austere– there are no common religious symbols anywhere– there are good reasons for these omissions. The nearly uninterrupted walls insulate church activities from street noise and mask a rather ordinary streetscape. Of course, religious buildings are often introverted–you don’t sit in the Hagia Sophia and long for a view. Bagsvaerd Church’s introversion allies the building to a tradition of religious architecture, which turns inward from the everyday world to offer, in its place, a transcendent realm with a focus on the eternal through a symbolic vertical orientation linking earth and sky. At Bagsvaerd, this connection is established with skylight-gathering spaces aimed upward and grounded by means of the structure’s horizontal elements. It comes as something of a surprise, at least on a first visit, that just on the other side of Bagsvaerd’s blank exterior elevations is a continuous, inhabitable, channel of light. This channel is a part of the network of corridors that surrounds and crosses through the building, guiding visitors and gathering light. The corridors are tall (about twice their width) and continuously glazed overhead. They admit skylight in all seasons and domesticate sunlight, which, once admitted, is induced to reflect and re-reflect from upper surfaces downward. Low sun, rising in the east and setting in the west, is also intercepted by cross beams of varying increased depths in corridors running east-west.7 Sunlight is scattered by fine textured, white interior wall surfaces. If it seems brighter in the corridors than outside, even on overcast days, it is because, as Utzon has explained, white walls reflect more light than relatively dark houses, landscapes, and plants. “The light in the corridors” he wrote, “provides almost the same feel as the light experienced in the mountains during a sunny day in winter, making these elongated spaces happy places in which to walk.” 8 Recent research establishes a firm basis for the feelings of well being that result from exposure to illumination rich in wavelengths found in daylight, including light from an overcast sky.9 While the specific mechanisms for the relationship between light and health are not completely understood, it is reasonable to believe that the invigorating atmosphere of Bagsvaerd Church is realized by the quality of its light and the strategy behind it. It is a place for people and light in motion. Perhaps no individual architect, with the possible exception of Sir John Soane, has explored the possibilities of the courtyard more than Utzon (at least since the construction over many years and by several builders, of the Alhambra in Spain). Utzon employed courtyards in a number of early projects and in all of his built works after Sydney, which is, in fact, a piazza or public square, a type of courtyard. Bagsvaerd Church incorporates six courtyards, seven if you count the sanctuary. Each improvises a slightly different combination of uses and influences so that the courtyards become entries, gathering spaces, gardens, spaces that extend the visual reach of small interior rooms, and receivers of light from the top of the sky. Through these courtyards, sun and skylight are translated into interior light. The surfaces of the courtyards receive light and reflect it toward the wood and glass screens that enclose adjacent rooms. The screens, roughly equal portions of wood and glass, are infill partitions rather than wall. They filter incoming light and blur the distinction between interior rooms and exterior courts. The courtyards, in combination with the church’s corridors, make daylight available to the rooms of the church from two sides. With corridors crossing the building, courtyards carved from its center, and white interior walls, light seems to come from everywhere. Summer sun is softened and the few precious hours of winter light are distributed generously throughout the building10 so that the interior appears to be suffused with daylight throughout the year. The introduction of skylight into Bagsvaerd Church brings to mind Sir John Soane’s Bank of England, which similarly met its surrounding streets with a massive, windowless, horizontally rusticated screen wall that concealed an array of variously skylighted rooms and courtyards. Together, Utzon and Soane pose a very modern question: by what means can we bring the outside world inside? Because of the ways in which courtyards domesticate a bit of nature, gather daylight, make shade and shadow, block or welcome breezes, and open themselves to the sky, they lend us a version of that exotic both/and sensation, in this case, one of being inside and outside at the same time,11 so that a visitor feels the thrill of being simultaneously exposed and protected. Because it is controlled yet open, the courtyard is a space in which people and light are encouraged to improvise. At Bagsvaerd, the sanctuary’s embrace of the outside world fulfills the promise of Utzon’s well-known conceptual sketches. The two sketches depict congregants assembling under a canopy of clouds and then under a series of rolling vaults, an idea the architect investigated at least as early as Sydney, conceptualized in sketches for his 1962 essay, “Platforms and Plateaus,”12 and experienced for himself on the seashore in Hawaii.13 This idea was finally incorporated into his experience of the Nordic sky14 at Bagsvaerd where the sanctuary ceiling is an abstracted representation of the sky. Understood in this way, the sanctuary may be considered the church’s seventh courtyard. The traditional courtyard makes a small part of the outside world into interior space by surrounding it, usually to the extent that the sky is perceived to be a ceiling. In other times, church ceilings, domes, and vaults often depicted the sky or heavens in paint. But the sanctuary at Bagsvaerd Church uses the Nordic sky as a working model for the illumination of the room. The form of the ceiling vault is not only inspired by clouds, but also works much like a cloud as a canopy and a reflector of light. The clerestory windows high on the west side of the sanctuary vault allow skylight and warm afternoon and evening sun to break through and play on the vault. The light is reflected and re-reflected so that it is further softened, until the brightness of the vault is gradually reduced to a darker underside where, like a cloud, it shades itself. Again, the sanctuary and corridors may be compared to similar configurations in the buildings of Sir John Soane, in particular the skylighted zones on opposite sides of the breakfast parlor dome in the Soane’s house at Lincoln’s Inn Fields. In this room, Soane, like Utzon, brought light into a space through skylights flanking a canopy. Detached from two walls, the canopy’s independence is emphasized, strengthening the perception that it floats in space. Soane’s canopy and Utzon’s vault focus their spaces while they distribute light from openings at their peaks. As the adjacent skylights cannot be seen easily from beneath the canopy, daylight appears to emanate from brightened wall surfaces. This lends the light a certain mystery– “lumiere mysterieuse,” Soane called it15–as its source, at least momentarily, is uncertain. In Soane’s and Utzon’s spaces, one is compelled to stop and think about how this daylight gets into the middle of a building and how it seems to originate from a solid wall. In the development of its sanctuary ceiling, Bagsvaerd distinguishes itself, not only from churches with ceiling paintings of scenarios from the Bible, but also from modern predecessors. Consider Erik Gunnar Asplund’s domed ceiling inside the Woodland Chapel (1918-1922). At the chapel, skylight is filtered by tall surrounding trees, through a translucent oculus at the top of the dome, and distributed evenly by the dome’s smooth, white, spherical surface. The room beneath the dome is painted gray and is larger than the dome, which then appears to float. Asplund’s chapel is centralized, cool, and still, with a single, vertical orientation. In contrast, Jorn Utzon’s sanctuary at Bagsvaerd is multi-directional and instantly enlivened by changes in daylight. It is oriented variously north-south with the vault; east-west by the axial progression of entry to altar; and vertically, into the vault toward the sky and light. The transverse (north-south) orientation is a directional adjustment that broadens the room, bringing worshippers closer to the service, a departure from the traditional alignment of the congregation and altar with the direction of the vault. The western outlook of the high clerestories favors skylight rather than direct sun during Sunday morning services, but some daylight is available to the sanctuary from all sides. Sun enters through skylights, brushing the flanking corridor walls; it filters slowly through entry courtyard screens; and it sneaks in from the vestry skylight behind the altar. Light entering from around the room strengthens the feeling that the cloud/vault floats and the perception that the sanctuary is a transformed version of the world outside. The daily variations of daylight are displayed on wall and vault surfaces, and the texture of the vault formwork is revealed. Asplund’s cemetery chapel is a world apart, and time stops. The sanctuary at Bagsvaerd Church is animated by light, connected to the world, and life goes on. Utzon’s lighting strategy is by no means pure–it accommodates the unpredictable–but it should not be mistaken as coincidental to the design. In fact, his intentions can be further, if indirectly, confirmed by his use of the same strategy, but inverted, in his own house. Can Lis, the first of two houses Utzon built for himself on the Spanish island of Majorca, was designed and built at roughly the same time as the church. It gave the architect an opportunity to enlarge his vocabulary of light and space by translating his skylighting strategy to a Mediterranean setting. Unlike Utzon’s native Denmark, in Spain the sun traces an arc relatively high above the horizon. So, at Can Lis, instead of reaching upward for light, openings are aimed at the horizon. The living room projects episodically toward the meeting of sea and sky with five glazed window bays, each about the size of a person and aimed at a different angle from southeast to southwest. The bays at Can Lis resemble the deep-set openings in Le Corbusier’s chapel at Ronchamps, but as at Bagsvaerd, Utzon’s light-gathering devices can be inhabited. All year long, the bays reach out horizontally to gather skylight and intercept sunlight, while at the same time framing stunning views of the Mediterranean for the living area. When the sun is low in the sky, early in the day and during the cooler seasons, it is admitted deep into the room. But when the sun is high, the direct rays of the sun are received by the bays. On these days, the warm-colored sandstone surfaces of the bays intercept sun and skylight, lend a little color, and diffuse it into the living room. A courtyard on the north side domesticates high sunlight before it is admitted into the house. And, in the afternoon, a small opening high on the southwest wall invites a spear of direct sunlight to move through and enliven the room. Bagsvaerd Church is not about fine materials or intricate detailing. Utzon’s concern lies with the insightful use of that which is common: materials such as concrete and wood, forms familiar from the history of building, and most common of all, daylight. The prefabricated and repetitive building systems (structure, cladding, flooring, infill screens) are intended to standardize construction procedures and minimize details, an approach that justifies, at least theoretically, the legendary paucity of drawings produced by Utzon for his projects.16 The church relies on the qualities of its surfaces and the play of light on textures to reveal the directness of construction and the inherent qualities of materials as well as to realize the character of its spaces. Surfaces such as floors, walls, and ceilings are distinguished as much by varying reflectivity than by differences of hue or material. The Church’s cool, light atmosphere alludes to a tradition of Scandinavian modernism and enlarges that tradition’s spectrum of whiteness. In general, surfaces are finished so that a visitor is more likely to look directly at a matte finish or fine texture and to see diffused light than to see a shiny surface, bright sky or sun. Inside, white concrete floor planks are polished but wall-cladding planks at eye-level are white and fine-textured, each distinguished from the other by a joint of gray mortar. The organization of building elements is read through the highlights and shadows of joints, a large-scale texture resulting from the required separations between cladding or floor planks and between planks and structure. The undulating ceilings throughout the church are concrete sprayed over reinforcement into wood forms and painted white. The textures of the forms remain visible in highlights and shadows as evidence of the process of casting concrete, the making of a liquid into a solid. With the fluid form of these vaults, the perception that they float, their concrete construction, and the play of daylight on their surfaces, they convey complementary impressions of weight and weightlessness, movement and stability, inside and outside. With the design of the Sydney Opera House, Jorn Utzon revealed himself to be one of the great formgivers of modern architecture, so it is highly significant that he never relied so specifically on this aptitude again, at least not for its own sake. Nor does it appear that Utzon returned from his world travels with a menu of unique or exotic forms. Instead, his work displays a confidence in the validity of what is fundamental in architecture, those ideas that are shared across cultures. In Jorn Utzon’s world, that which is common is observed closely for its true value. Few of Utzon’s projects, particularly those built after the Sydney competition, are concerned with the production of extraordinary shapes, and where Utzon does create unusual forms, they are invariably conceived so as to receive daylight. It is likely that, having experienced dramatically different lighting conditions around the world, his understanding of the special qualities of Nordic light was clarified. Wherever he worked, Utzon used his understanding of sun, sky, and daylight–essential characteristics of a particular place–and basic architectural elements to generate space and form. And, in a reciprocal way, he then used space and form to develop the character of daylight inside his buildings. Utzon took inspiration from his observations of nature.18 The world of constant change within a universe of order is his model for spatial character, for tectonics, and certainly for illumination. As Bagsvaerd Church collects waxing and waning light, passing shade and shadows, evolving color, direct sunlight, and diffused skylight, the church makes a case, implicitly, for a changing and non-uniform lighted environment. This approach runs counter to standard practice in lighting design, which seeks uniform illumination through unvarying electric light. Most importantly, the devices Utzon designed to receive daylight are spaces meant to be inhabited; Bagsvaerd’s opaque walls do not keep the world out; instead they gather it in. While the care and caution with which light is admitted into Utzon’s buildings speaks to the difficulty of responding to northern sky conditions, we cannot overlook the degree to which this note of reticence may have a source in the personality of the architect. For even beyond his sensitivity to glare, Utzon’s efforts to gather light indirectly or make his own light when necessary, parallel his own hesitance to engage the world directly. A man described as “a shy person,”19 “reclusive by nature” and “intensely private,”20 Utzon found himself in the most invasive and public of professions. He must have been fully aware of the need to mediate between social and private life and he translated this intuition into an architectural vocabulary that interceded with the world in order to perfect it. His buildings seldom employ individual windows; even the bays at Can Lis are more like personal courtyards than windows. Utzon’s architecture redirects light, controlling views through layers of walls and by his re-imagining of the world as a series of courtyards. In this way, he addressed a fundamental architectural question: how to make community next to privacy. This is probably Utzon’s great legacy: the essentially ethical idea that architecture might see beyond the limitations of the clever object and, instead, create spatial options for as many kinds of human relationships that we might like to invent or improvise, relations that change, like light moving through space. Marc Treib, “Clouds of Concrete,” Progressive Architecture, September 1980, pp 166-167; and Christian Norberg-Schulz, “Church at Bagsvaerd in Jorn Utzon Church at Bagsvaerd near Copenhagen, Denmark. 1973-76, Global Architecture 61 (Tokyo: A.D.A. Edita, 1981) p 2. Utzon has long had an interest in systems that admit change. At the Sydney Opera House, all of the variously sized roof shells were derived from one large sphere. This permitted all of the shells to be clad with tiled elements from a relatively small set of different pieces. Also at Sydney, the long beams supporting the public podium vary in section between spans in response to different forces. It may be that, in his later projects, Utzon realized that a building could be configured quite simply and that variations could be achieved by allowing the moving sun to play on a building’s surfaces. Jorn Utzon, “Bagsvaerd Kirke,” unknown source, pp 23-25. Bent Rying, ed., Danish in the South and the North, Volume I; Denmark an Introduction, Prehistory (Copenhagen: Royal Danish Ministry of Foreign Affairs, 1981) p 12; and Christopher Gronbeck, “Sun Position” a software program available at www.susdesign.com (1999). 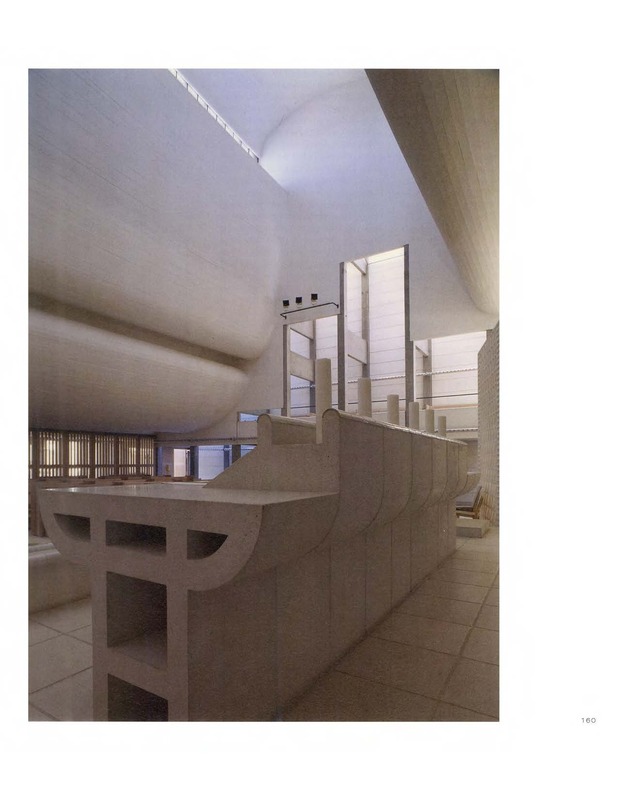 Richard Weston, Utzon; Inspiration Vision Architecture (Hellerup: Edition Blondal, 2002) p 370. Richard Weston, op. cit., p 286. Jorn Utzon, op. cit., p 23-25. Interview with Mojtaba Navvab of the Taubman College of Architecture and Urban Planning at the University of Michigan, 01.19.05. Dr. Navvab is a research scholar noted for his work in the field of lighting and its relationships with human behavior and energy use. Marc Treib, op. cit., p 168. For an evocative argument in favor of a rich thermal and lighted environment see Lisa Heschong, Thermal Delight in Architecture (Cambridge, MA and London, England: The MIT Press, 1979) pp 18-21. Jorn Utzon, “Platforms and Plateaus: Ideas of a Danish Architect,” Zodiac, no. 10, 1962, pp 112-140. Francoise Fromonot, “Un riccordo della Hawaii,” Casabella, October 1997, (649), pp. 24-37. Richard Weston, op. cit., pp 280-281. Christopher Woodward, “ ‘Wall, ceiling, enclosure and light:’ Soane’s Designs for Domes,” in Margaret Richardson and MaryAnne Stevens, ed’s., John Soane Architect; Master of Space and Light (London: Royal Academy of Arts, 2002) p 62. Conversation with Richard Weston, 09.02.03. Per Jensen, “Jorn Utzon: I am inspired by the clouds,” in ed. The Reverend Dean Svend Simonsen, tr. by Onni Kyster, Bagsvaerd Church (Bagsvaerd, Denmark: Bagsvaerd Parochial Church Council, no date) unpaginated. This document is the English version of the eight-page pamphlet available at Bagsvaerd Church. Richard Weston, op. cit., p 23; and Philip Drew, The Masterpiece; Jorn Utzon, A Secret Life (South Yarra, Victoria: Hardie Grant Books, 1999) p 59. Philip Drew, op. cit., p 6. Richard Weston, op. cit., p 40.